You may recall that I wrote a blog about my installation of an over the air television antenna. My saga to secure quality TV viewing continues with this blog. Which I have entitled "AT&T U-Verse Leaves A Lot To Be Desired". More specifically, it's the Internet service that leaves this blogger unsatisfied. The television seems to work pretty well which may be at the expense of the Internet service. Here's my story. I hope it's helpful should any of my readers decide to tread the perilous water that are AT&T U-Verse. In November 2011 as the 12 month trial period for my $20 per month AT&T DSL service was about to end in December I started looking at alternative Internet service providers. I had used Dish Network as my satellite television service provider for several years and was growing dissatisfied as the fees increased. AT&T had installed new cable in my subdivision almost two years ago. I assumed it was for U-Verse. However, whenever I checked the AT&T website for U-Verse availability it always said “Currently, AT&T U-Verse service isn’t available for:” followed by my home address. I spoke to the AT&T technician as he installed my DSL in December 2010 and he said at that time that U-Verse was available at the street. Since I had the 12 month introductory rate of $20 I decided to wait before pursuing U-Verse at my home. Well, that wait was almost over last November so I started calling AT&T to try to get to the bottom of the matter. I check the website, no change. I spoke to the technician I met 11 months prior, I had kept his card. I called AT&T customer service many times. Finally after about two weeks and some dogged determination on my part I finally spoke to someone who was willing and able to help. I told her that my neighbor’s address showed that they had U-Verse availability but my address did not. I told her that the box was located at the street equal distance from our homes. I told her that the technician said I should be able to have service. I even polled 40 of my neighbors via e-mail to see if anyone else already had service. Two of them replied that they did. Within a few days, and after a few more calls, I was able to schedule an installation date. It was about a month away in mid-December. I told my other next door neighbor. They wanted to try U-Verse too so they called the direct telephone number of the person I had spoken to and also scheduled an installation. About three week later and a week before my installation I got a call from AT&T. They left a message stating that they’d have to reschedule my installation. I was unable to reach anyone at the number provided. So frustrating! A few days later the exact thing happened again. They called again and left a message stating that I needed to call a number to confirm my new installation date and time. I tried to call back to confirm but the tangled web of press this number, then press that number left me without a confirmation. An automated caller leaving a message that is un-returnable. Perfect! I knew my installation would not happen unless I solved this problem too. Eventually I was able to go online and confirm the new date for the installation. This option was never mentioned by the robo-messenger. Now I had a confirmed date and time range for my AT&T U-Verse installation. That would be on January 5th, 2012. All the advertising must be working I thought. AT&T’s installation calendar is booked solid and I considered myself lucky to get in on the hype. The technician arrived and got to work. I was ready to disassemble my Dish Network and move on to something newer with more features and with all the promotional pricing I was sure that I was getting a good deal. How could I go wrong? Another AT&T technician had already replaced my old outside telco box with one designed for U-Verse earlier in the day. All the U-Verse installer had to do was run a Cat-5 Ethernet cable from the box to a telco jack inside my house. He chose the nearest jack to the box which just happened to be in the master bedroom. I was surprised to find out after the installation that he had run the white cable along the outside of my house when it would have been easier and less unsightly had he run it inside the basement which is open and has easy access. He installed the Ethernet cable, the receivers, and a dedicated wireless access point for one receiver which he located upstairs. Fortunately, when my home was built the owner ran coax and telephone lines to all the rooms. In the end, my installation included three wired receivers, one wireless receiver, a wireless access point, a wireless router, and a USB Wifi adapter. The wired receivers were located in the master bedroom, basement, and family room. The dedicated wireless access point is located in the master bedroom along side the router. The wireless receiver is located on the second floor in my wife’s home office. Along with the U-Verse equipment we also have two Samsung Android smartphones and a laptop vying for Wifi bandwidth. In my wife’s office are an HP network printer, a Dell PC, and Ooma TeloVOIP phone with a secondary line to the printer for faxes. To get my wife’s PC on the network the technician installed a USB Wifi adapter. Before he left we verified that everything except the printer and Ooma were functioning and reviewed a few of the receiver features. He left four channel guides but no other literature for the equipment. My wife and I were excited. I could watch recorded shows of great significance while she watched the equally life changing shows like the housewives of somewhere. Shortly after the technician left the house the trouble started. My laptop would disconnect from the network and re-establish a connection minutes later, or not at all. Sometimes I cycled power to the router. That would usually fix things temporarily. When the Wifi went out on my laptop it was also out on both smartphones. My wife had worse luck with her PC. It seemed to be disconnected from the network more that it was connected. I removed the USB Wifi adapter from her PC and ran an Ethernet cable from the wireless receiver instead. That seemed to work okay. Then I connected the Ooma to the same U-Verse wireless receiver. That worked okay for a few days but there were wires all over stretched from one side of the room to the other. She wasn't in the office that much anyway. So, everything is connected to something except the network printer. I hooked that up too. Now everything is the way it was but now it doesn’t work right and my wife is ready to kill somebody. I decided I needed a wireless access point upstairs to better connect to the Wifi network. I ordered a Cisco-Linksys WRT610N WAP from Amazon. It was at my door in a few days. I spent the next six hours getting everything working with the new hardware before going to bed. I told my wife “I fixed it”. Our relief was short lived. When I woke up the network was down again. I called the AT&T customer service people. They wanted to charge me $149 to install the router in the location where it should have been installed less than four weeks prior. We suffered through the next few days before Susan said she would call customer service. She did and they said they would send their “premium” technician to the house. He arrived around noon the next day. I briefly went over the symptoms of the problem and the locations of the various boxes. The technician had planned to remove and replace hardware but he realized, as did I, that it wasn’t a hardware problem. He said our house was too big. He was right. The signal from the router was losing its strength as it passed through several walls to each device. A second issue which no one seemed to recognize was the use of bandwidth. I was paying for 12Mbps but I am only getting 2.6Mbps. Maybe 3.6Mbps if I was lucky. I also ran several speakeasy.net speedtests to the Atlanta location and the results were the same. The “premium” technician tested the signal at the receiver in the family room. Before leaving our home he recommended that we purchase an AT&T Wifi Booster. Fed up, Susan and I were in the car and at the AT&T store within the hour. After looking at the unit I knew it wasn’t what I needed. All three salespeople at the store concurred. However, I had dragged my wife into this whole U-Verse fiasco so I thought I had better leave the store with something. I paid my $215 and headed out to the parking lot knowing full well that I’d be back in a few days to stomach the 15% restocking fee for a piece of hardware I didn’t need and wouldn't even remove from the box. Obviously, the premium technician was not familiar with the unit he was recommending. Wifi boosters are available but the 3G MicroCell is not one of them. For that matter, I can see no logical reason to purchase the device. It connects to my wifi network but still used my minutes and data from my wireless plan. I don't think so!!! So, here I am six weeks into my AT&T U-Verse experience and I can’t get out. I don’t have a contract but my wife wants to keep her Bellsouth e-mail address. I upgraded my bandwidth to 18Mbps which probably means I’ll actually get 6Mbps. My service did improve. 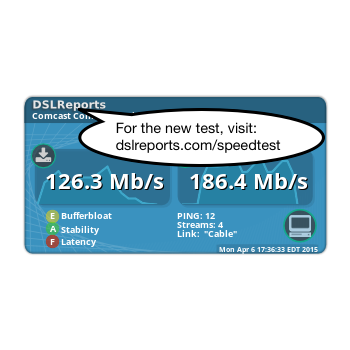 Speedtests through speakeasy.net to Atlanta yielded results of 11.35Mbps and 13.83Mbps download speeds. Other U-Verse customers have spoken well of the service to me but my experience from the start has been abysmal and I won’t even go into how what was supposed to cost less than $100 per month was $224. I must have paid extra for something. After reviewing my bill I realized that AT&T started charging me for service at the original installation date. Will it never end! One last bit of advice before I end this tirade, don't initiate combined billing until several months have past and you're sure that you're being billed correctly. One of my co-workers has Charter cable and gets between 80Mbps and 100Mbps Internet download speed at his home. I guess I should move. 2/24/12 Update: My U-Verse is back to it's old self again. While the Wifi connection seems more stable with the higher priced plan the speed is still abysmal. I had to say higher priced because I'd obviously be lying if I said faster plan. This is what AT&T calls 18Mbps Internet service. It almost looks like dial-up to me!